I really hate waking up in the morning. Really, really hate it. But I can’t scroll through a single social media site without being informed that all successful businesspeople have 5 things in common and somehow, waking up early is always one of those things. So, in addition to shelling out $1.99 on the most intense alarm clock app you can find**, I have also implemented a nice, relaxing activity to start out my mornings. I gave this activity an equally relaxing name: The Daily Knowledge Bomb. Every morning, my alarm goes off and forces me out of bed to take a photo of my bathroom sink, puts me through a mind-stimulating activity, and reminds me of the things I want to accomplish each day. Then I wander downstairs, make a cup of coffee, and take it back up to my bed where I spend the first hour or so of my day reading. Why not share the wealth? I thought it would be nice to give a nice little book report on the books that I read, or sometimes listen to. Spoiler alert: they are all likely surrounding the topic of women’s leadership, profiles of amazing women, and on the whole will help to make me into an amazing woman worthy of profiling. So here you have it, my first book report. 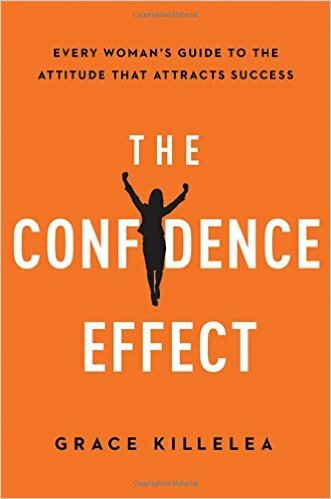 I hope I get an A.
I bought this book because confidence has always been one of the key components to the Gild mission. From day one, we knew we wanted to encourage confidence in women through creativity and community. And now, as we continue to make changes to our business, instilling confidence in women–especially those in the workplace–is always top of mind. It’s something I consistently struggle with, even as I work to help others feel like they can take on the world. “People like to work with people who are comfortable saying they are good at something.” Just this past week I was at a creative meetup and each person was asked to share three things they they were good at. Three things they could offer to the other people in the room. Everyone there was surely brilliant, creative, resourceful, and impressive, and yet everyone looked terrified. It is so hard to rattle off a list of the things we are good at because there is a fear that someone is going to… what? Call you out in front of a room of people? Not happening. If you are good at something, people want to know it and they are going to respect you for it. So when it came around the table to me, I was prepared and I shared, and it felt pretty darn good. Conducting a brand audit. Killelea encourages everyone who attends her workshops at Half the Sky Institute to conduct a personal brand audit. Taking the time to observe how people respond to you, asking for feedback, and conducting your own performance evaluation. Doing this exercise can help you to figure out where you’re excelling and where you might be falling short in your interpersonal relationships. If you have the smarts, but don’t have the soft skills figured out, you’re still going to run into challenges. Last December, I wrote a blog post about getting tough feedback and learning how to use that to “work on yourself,” and I think this is so important. Not just for people who work at small companies like I do, but for people that work on teams within larger organizations. Feedback can be difficult to hear, but it is going to make you better, faster, stronger… or so Kanye tells me. “Resilience is a mark of all success stories, much as it is the mark of every good leader.” In the final part of Killelea’s book, she talks about the importance of bouncing back from failure and disappointment, but also recognizing what lead you to those things in the first place and adjusting so that, as a leader, you don’t keep running into brick walls. When Gild began, things on a whole were going pretty smoothly for us. We had a great product, great support from our accelerator, and people were pickin’ up what we were puttin’ down. But when the time came for us to face our first major obstacle (something that all early-stage companies will encounter) the biggest question wasn’t whether or not we should pivot, or whether or not we were working hard enough, but rather - were we resilient enough to try, fail, learn, and try again? Did we have the grit, tenacity, passion, drive, (and many other words people like to throw around when talking about starting a company) and resilience that it would take to keep the company going? For Rachel and I, the answer was yes. And we have been working every day since then to build the company in a way that the answer will always be yes. That often means adjustments and changes along the way, but they are all part of avoiding that brick wall. Newer PostThe workshops are coming! The workshops are coming!